LAKE WORTH -- In the beginning, there was Pam. Rev. Pam Cahoon, left, retires after 35 years with CROS Ministries, handing the reins to a new executive director, Ruth Mageria. Photo from CROS Ministries. Thirty-five years later, a phone call to CROS Ministries yields a directory of more than a dozen staff members in multiple programs that draw thousands of volunteers, most of them dedicated to stamping out childhood hunger. Away from her job as CROS executive director, Rev. Pam Cahoon is a recognized name in health and human services throughout Palm Beach County and beyond. Her efforts to help the disadvantaged led her to leadership roles fighting child abuse and neglect, advocating for affordable housing and even founding a musical theater program for kids who can’t afford private lessons. Last month, Cahoon, an ordained elder in the Florida Conference, retired from her post at CROS, which stands for Christians Reaching Out to Society. 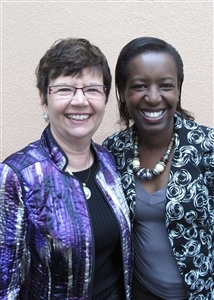 Taking her place will be Ruth Mageria, a longtime CROS employee who hails originally from Kenya. Locally, Cahoon is a household name. A local newspaper announced that she was retiring after 35 years as the county’s “top crusader to end hunger.” The Palm Beach County Commission is naming a day in her honor this week. And U.S. Rep. Alcee Hastings called attention to Cahoon’s retirement and list of achievements in remarks to Congress earlier this month. But “being a witness in the community for the church” stands out as her highest achievement, and taking CROS Ministries in an ecumenical and then interfaith direction early on was one of her best recommendations to the board. “There were only 300,000 people in the county at the time [CROS began], and now there are 1.3 million,” Cahoon said. Today, nearly 100 churches, temples and mosques have thrown their support to CROS, and last year the ministry provided food to about 55,000 people in Palm Beach and Martin counties. Cahoon grew up in Jacksonville, receiving her bachelor’s degree in sociology from Jacksonville University and her Master of Divinity degree from Emory University. She served as associate pastor at St. Paul UMC, Jacksonville, before becoming a staff of one at CROS in 1979. It was in Jacksonville that she first became involved in urban ministry, and that led to her interest in CROS. “I think I saw it as a way to be creative and get churches involved in the community,” Cahoon recalled. She said she spent the first summer at CROS asking people in the community what the greatest needs were. “Food just kept coming up, coming up, coming up,” she said. Her ministry has included chairing the Florida Conference Outreach and Refugee Committee, the District Committee on Ministry and District Superintendence Committee for what is now Atlantic Central, as well as service on other boards and committees. She served one quadrennium on the General Commission on the Status and Role of Women and has been a jurisdictional delegate five times. Cahoon believes she leaves CROS in good hands with Mageria at the helm. “She is a person of great faith and integrity, and she’s warm and sensitive,” Cahoon said. Mageria started her 12-year stint at CROS as a camp coordinator and then food pantry coordinator before becoming director of Volunteers and Congregational Development. She took a break from CROS for about three years to work in ministry in Kenya, then returned in late 2013 to work with Cahoon in preparation for the founding executive director’s retirement. The new executive director said she plans to continue efforts to end hunger in the area by facilitating connections between faith-based and other types of nonprofit organizations. She hopes to also focus on collaborating with other agencies to develop job training opportunities that help struggling families become self-sufficient. Tops on the list of Cahoon’s plans for retirement is spending time with her four grandchildren. But she said she plans to continue in ministry.